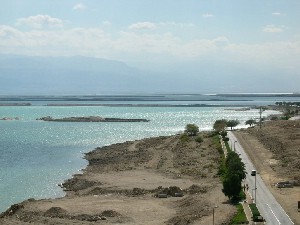 We reach the shores of the Dead Sea encrusted with white salt and follow the shoreline towards Masada. Although its possible to climb the ancient Snake Path up Masada as the Romans did 2000 years ago, we take the convenient cable car up to the mountain top plateau. It was here that King Herod built a fortified palace complete with every convenience. Heading back to the Dead Sea we pass the desert oasis of Ein Gedi where there is lush foliage and hidden waterfalls and where David hid from angry King Saul. We also pass by Qumran were the 2,000-year-old Dead Sea scrolls were discovered in several hillside caves.